Shark Shields offers piece of mind for you and your family. he Shark Shield is a lightweight personal unit designed for spearfishers, snorkelers, swimmers and surfers. It emits a frequency extending out approximately 8 meters. Offering those who wish to enjoy the ocean without need to be concern about Shark Attack. What price is your life worth? The Shark Shield Freedom 7 has seven hours of battery life, which is ideal for Divers snorkelers and swimmers. 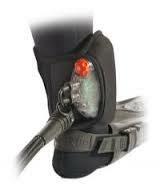 The unit is fitted to the lower leg with the supplied neoprene pouch. Attached to the pouch is an antenna which trails unobtrusively behind the user. Barely noticeable in the water, the Freedom 7 can be worn with or without a wetsuit, and is simple and easy to use and maintain. There is a slightly different unit for surfing. The Freedom Seven is not suitable for surfing and the Freedom Surf needs to be purchased. It comes with a leg rope attaches to the antenna and surfboard. The antenna actually becomes part of the leg rope. The Freedom will suit spearfishers who want peace of mind for those times and places where sharks are known to be a potential threat. The Shark Shield incorporates two electrodes, which project the field from the unit and thus create an invisible protective shield that surrounds the user. Both electrodes must be immersed in the water in order to give protection to the wearer. The field generated by the Shark Shield is detected by the shark through its sensory receptors known as the Ampullae of Lorenzini, situated on the snout of all predator sharks. 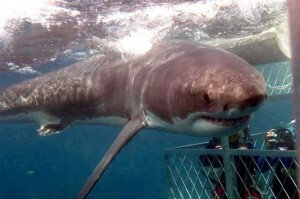 The initial discomfort increases if the sharks approach the transmitter until it becomes intolerable. The sharks then veer away and leave the immediate area.